This is the nicest, most superbly fragranced Mimosa tree and I have been watching it grow in Pimlico since 1995! Every year I await early March to see it in bloom. Over the years I saw so many trees growing near Grasse in France where I worked as a natural nose in the Perfumery. But this particular Mimosa tree is fantastic. Mimosa signals the start of Spring for me and is also a very nostalgic scent as when I was born my grandmother put Lilac and Mimosa in my mother’s room in France. Mimosa represents longevity, optimism and individuality and is said to lift spirits and help you shed bad thoughts so wonderful at this time of year. 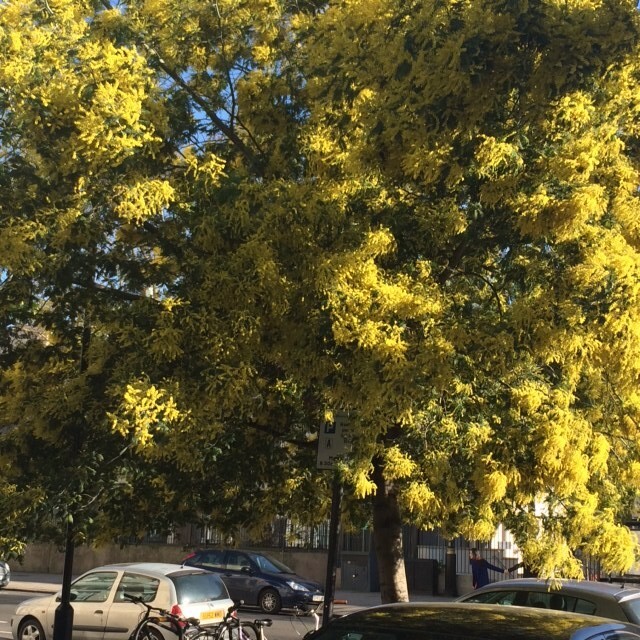 Acacia dealbata – or Mimosa – is rarely seen in London gardens and the only sprays of Mimosa you would normally see are in florist shops, flown in from the South of France and in the past regarded as exotic treats. I love Mimosa and appreciate its fragrance which has a sweet subtle tone .This London street is impregnated by its aroma which the wind carries for miles! So everyone can enjoy it. We must tell Boris Johnson to plant more Mimosas around London – why not make London a fragrant city? You may also be interested to know that Princess Diana used to teach at the Primary school to the left of the tree and it was outside that the very famous photograph was taken of her before her engagement to the Prince of Wales. Enjoy this wonderful Spring day.